Wi-Fi together with Bluetooth are said to be areas for hackers since these techniques enables easy and anonymous stealing of passwords. In order to stall these activities, a group of students have come out with a system which tends to utilise low frequency transmission to send passwords via the human body. On reversing the same system utilised by fingerprint sensors, they have achieved a method to generate wireless data transmission between the smartphones and the other devices. Senior author Shyam Gollakota, assistant professor of computer science and engineering at the University of Washington (UW) stated that till now, fingerprint sensors had been utilised as input devices. He further added that for the first time that fingerprint sensors can be re-purposed to send out information that is confined to the body. Fingerprint sensors had been designed for the purpose of receiving data about one’s finger which is utilised to authenticate identity. However, the UW team inverted the procedurealtering the technology into an output which tends to push the data comprising of a password or access code from the smartphone to the other device. 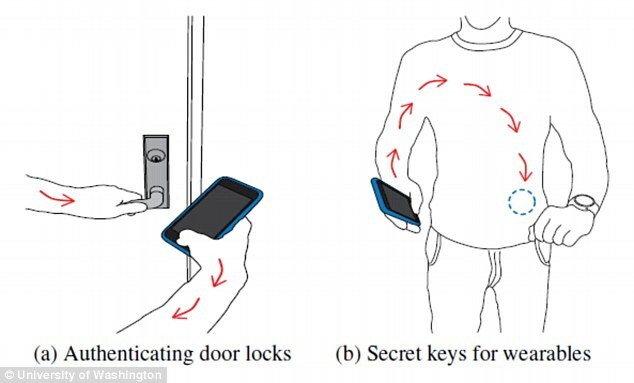 Co-lead author Mehrdad Hessar, a UW electrical engineering doctoral student explain that if one intends to open a door utilising an electronic smart lock he can touch the doorknob and touch the fingerprint sensor on the phone and transmit secret credentials via the body to open the door without leaking the personal information over the air. In experiments, the researchers had demonstrated this system utilising the Touch ID sensor of an iPhone 5s and iPhone 6s, together with the trackpad of a Lenovo laptop as well as other fingerprint scanners. During the evaluation, around ten subjects had been utilised and varied in height, weight and body type, which were capable of generating usable on-body transmissions. The team also envisaged positive results even when the participants were moving, like walking around or moving their arms. Co-lead author, Vikram Iyer, a UW electrical engineering doctoral student commented that they had shown that it works in various postures like sitting, standing and sleeping. Good strong signal is obtained throughout the body. The receivers could be anywhere, either on the chest, hands or legs and still tends to function. This ground-breaking project began by analysing smartphone sensors by the team in order to detect which one tends to generate low-frequency less than 30 megahertz and travels well through the body though does not propagate over the air. It was only fingerprint sensors and touchpads which were found to meet up with all these requirements. These methods tend to generate signals in the 2 to 10 megahertz range and transfers energy in an electric network to sense where in the space your finger would be. Moreover, it also identifies the ridges as well as valley which form the unique fingerprint patterns. The procedure which the UW utilised is a sequence of finger scans to encode and to transmit data. With a finger scan it tends to correlate to a 1-bit of digital data and without the scan correlates to a 0-bit. The team had also succeeded in bit rates of 50 bits per second on laptop touchpads and 25 bits per second with fingerprint sensors which were adequately fast in sending a simple password or numerical code through the body and to a receiver in seconds.